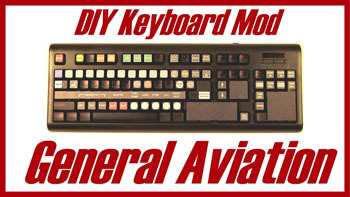 You can build DIY Flight Sims Keyboard Mods for serious sims or plane simulator games! You don't have to spend a lot of money to have aircraft switch panels for your homemade flight sim. Build these useful flight sim switch panels by modifying common computer keyboards. Yes, keyboards! They are delightfully inexpensive and readily available and these DIY videos show you how to make modified keyboards into a functional part of your flight simulator cockpit. Do it yourself and spend a lot less than retail. 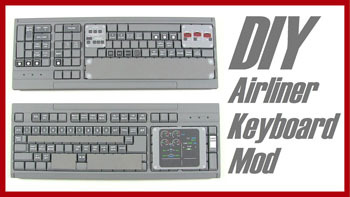 The keyboard mods work with the most widely used flight simulator programs and plane simulator games. See the individual projects for compatibility. View the online courses and learn how to build this simple solution that greatly improves your home flight simulator cockpit. The button templates provide an endless variety of ways you can customize this project to fit YOUR needs and your resources. Easy construction - no wiring, no soldering, no coding ! Great for general aviation flying. Start the engine without using the mouse, tune the radio and VOR with the keyboard buttons. Very helpful if you need to review your procedures or want to start flight training someday. One of my most popular products. It was so successful, I updated the project and produced a new instruction video and manual for it. People love having an inexpensive overhead panel like this for their flight sim airliner! 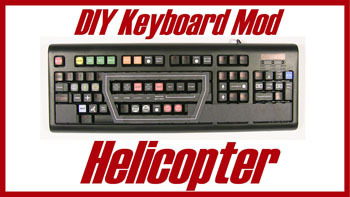 The DIY Helicopter Keyboard Mod is very helpful for the tricky startup procedure in light GA helicopters. It's inexpensive and easy to build. This also goes perfectly with the DIY Easy Helicopter Collective.